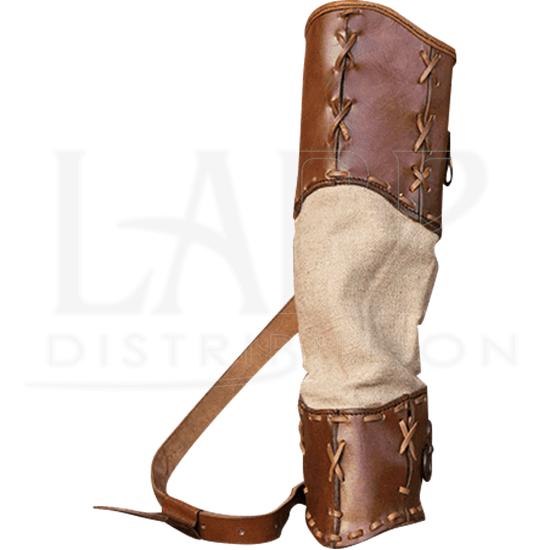 Consider all the roles available to the adventurer that includes the Wildling Quiver in their LARP arsenal. This archery accessory proves useful whether you unleash your skills within a high fantasy realm or a more traditional setting. This handmade quiver is fashioned from dyed, natural leather and beige canvas. Flattened leather cord forms the stitches that not only reinforce its structure and durability, but also contributes to its rustic style. Metal rings and an adjustable belt allow you to wear it either around your waist or over the shoulder.